March has been a quiet color month in the garden. We had late season, hard freezes, which ended the very early growth of many perennials. Not to worry, they'll be back, but I participated in a rather hurried and frantic push to get extra mulch over those tender plants before the forecasted overnight low of 20 degrees hit. I have found myself quite out of rhythm with garden time this late winter / early spring. Demands from the J.O.B. and children sports commitments have my mind swirling elsewhere. 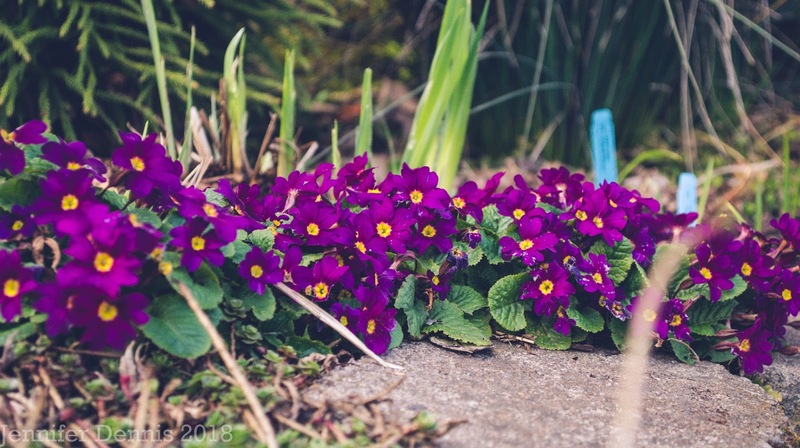 Getting this blog post published on Bloom Day didn't happen on time. 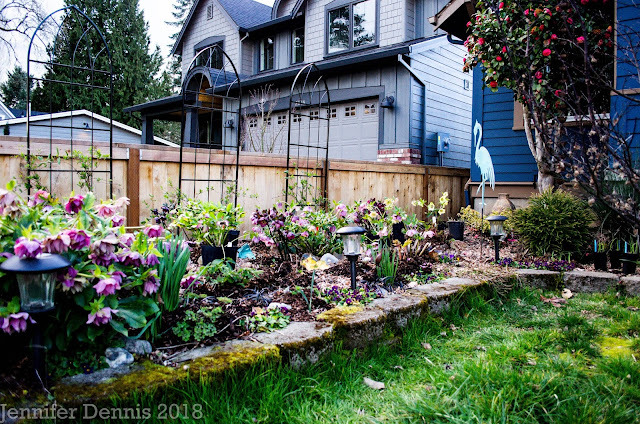 However, the thing I love about putting together Bloom Day posts, is that the act of photographing and documenting the garden brings me back to contented mental space. 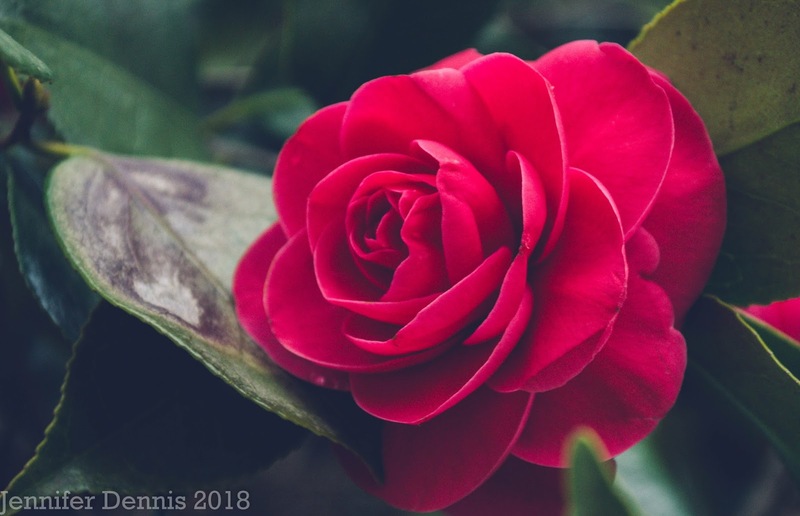 Below, the heirloom camellia tree, likely planted in the 1930's by my husband's great grandparents, had a plethora of perfect deep rose colored blooms this winter. 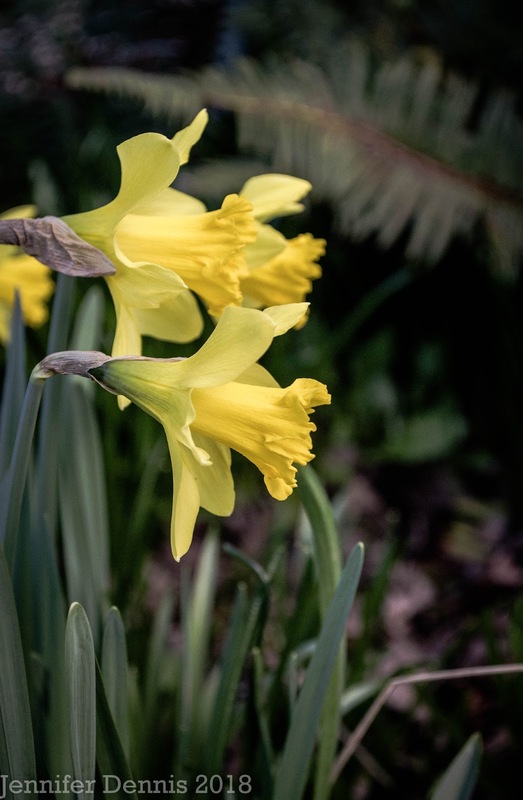 The daffodils, also planted decades ago, herald spring in NW Oregon. 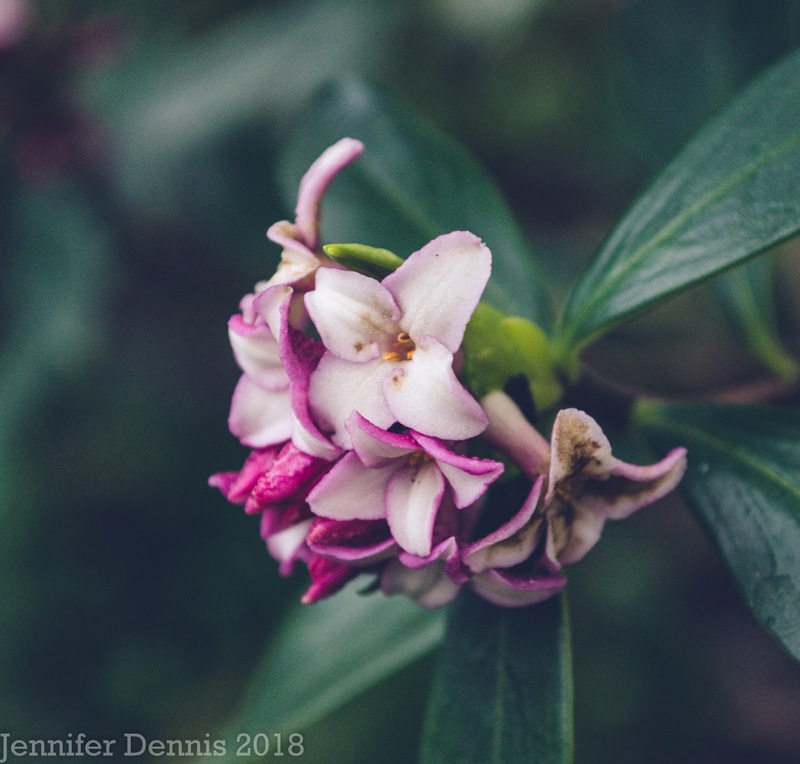 Daphne odora 'Zuiko Nishiki' has been a consistent, early spring bloomer for nearly seven years. I've had trouble with branches breaking under the weight of blooms in the past, so I cut it back after the blooming period to keep the plant more compact. The hellebores continue to bloom in the newly established front gardens. 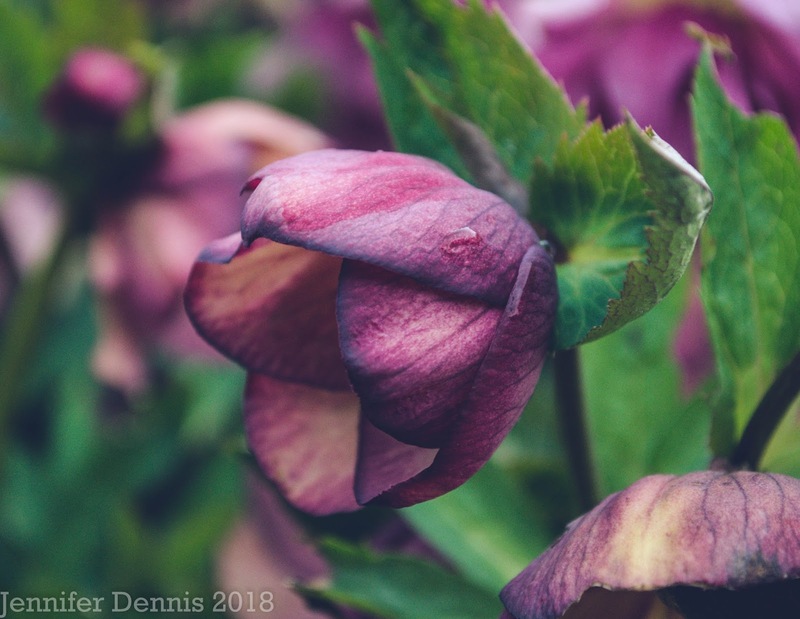 Below is helleborus 'Apricot Blush' from the Winter Jewels line. My daughter and my mother created some charming containers of spring bulbs last autumn. 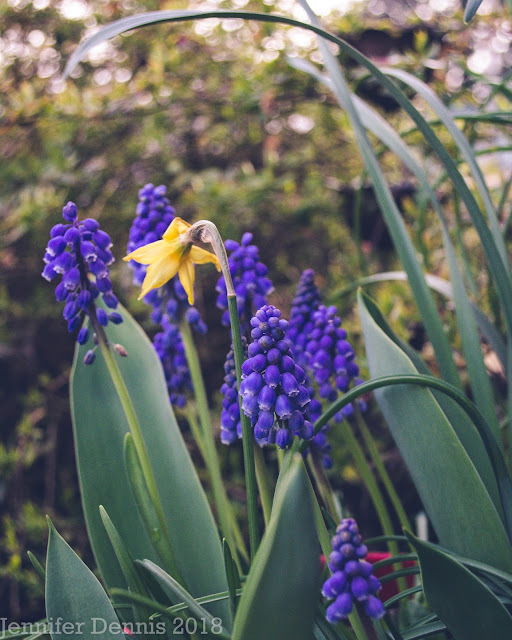 Muscari bloom with mini-daffodils on the steps to my front porch. Below, clumps of royal purple color....this primula was gifted to my by a former neighbor and I have not been able to ID them. They clump and spread nicely and are some of the first perennials to bloom in late winter. Here's a look at the newly established front garden bed. I've added three more hellebores in the past few weeks. I'm looking forward to a garden of nearly four season color. The columbines and bleeding heart fuschia's will be up next! Happy Belated Bloom Day! Spring is beginning here in Oregon and I'm looking forward to the season maturing in the months ahead. Your new planting is coming on nicely . I can see the climbers moving upwards. Could be 'Wanda' your Primula. I just love the colour of that camellia. And the front garden border is looking fabulous, can hardly believe it was so recently planted! The new border looks wonderful, and I love the shades of purple in your spring garden. Enjoy! We catch glimpses of very similar flowers each time they pop out from beneath the snow. I'm amazed that so far they keep bouncing back. Our camellia has just one flower. As for our daphne it arrived unannounced courtesy of a seed dropped by a passing bird. Sooo lovely. That hellebore is to die for and those primulas - they have spread so well. What's your secret?